Janet began by talking about books as a means of displaying our calligraphy. The advantages of books are that they are more tactile than pieces displayed in a frame; they also create a sense of mystery and surprise, and they can be quite personal or equally make a nice gift for someone. However, because books are handled there are things that need to be considered when using this form, rather than a hung piece, to display our work. We need to think about the form and how it will be viewed, the number of pages, the covers, the fastenings, how it will be stored and kept clean, such as in a box or slip cover. And, unlike a single page display, the direction of the paper grain. There are a number of basic techniques used in all bookmaking projects and Janet led us carefully through each of what she considered were five essential skills, namely Measuring, Cutting, Folding, Sewing and Gluing, although not necessarily in that order (see Notes and Tips). In addition to these five skills, an understanding of paper grain is crucial to making a successful book, something that doesn’t concern us if we are producing a flat piece of work. Machine made paper has a grain because of the way it is produced. It is important to consider the direction of the grain when making books (and cards), which should be parallel to the spine so that the pages lie flat. Janet initially had us tearing newsprint to test this out: it tore in a straight line much easier in one direction than the other. We later discovered this was true of folding as well. During the course of the day we made several different little books, each demonstrating and reinforcing one of the five techniques, although obviously there was some overlap when more than one of the skills were required to complete a project. 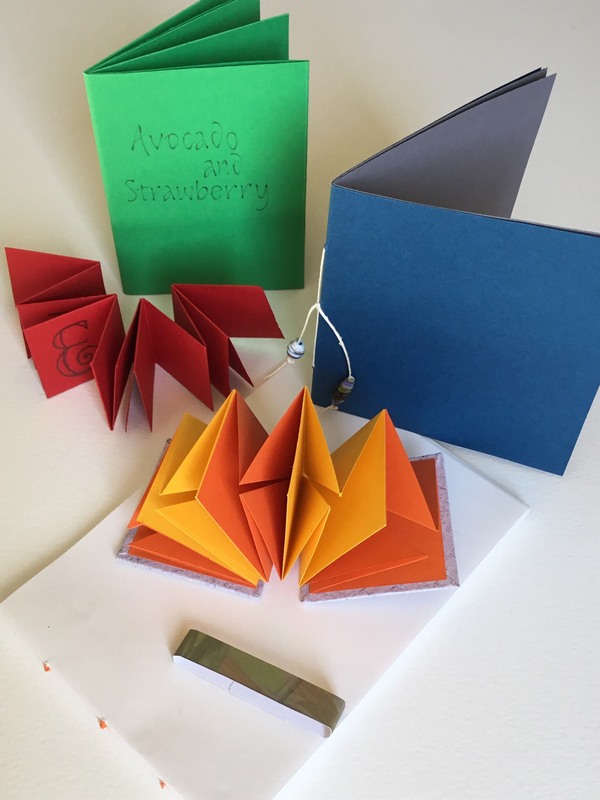 Most of us had, at one time or another, made the kinds of books we were making in this workshop but what made it particularly special and helpful were the many and varied little tips Janet gave us along the way, ways of making our work just that little bit more precise. We were rather pushed for time to get everything finished by the end of the day but we went home with happy faces and a variety of little books to inspire future projects, thanks to the guidance of our excellent, and well prepared, tutor.